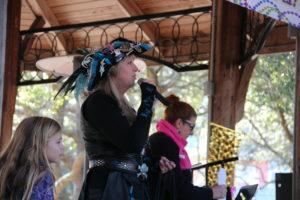 Pensacola Mardi Gras krewes and residents came together to celebrate the 8th annual Krewe of Blues Pin and Bead Swap in the city’s down town area. The event gave krewes the chance to swap tags, raise money for a charitable cause with a diaper drive and to present information on each of their organizations. 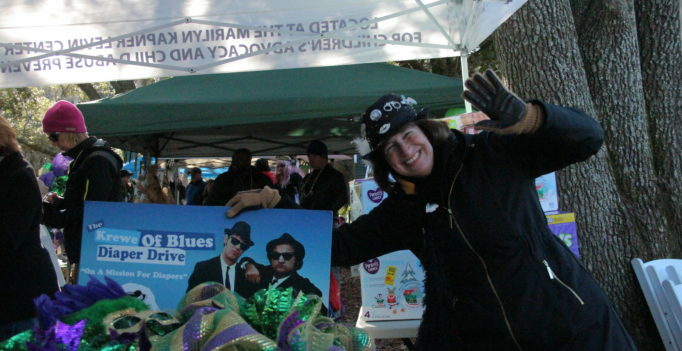 “It’s an opportunity to help krewes raise money for the charities that they support,” said Krewe of Blues President Duane Watson. 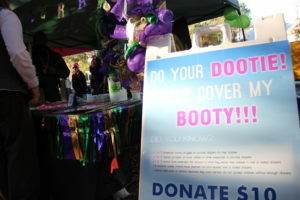 Each krewe had a table set up with items and information available along the street and in the park. “(This event) also gives krewes a chance to build rapport with each other, it’s a chance to say this is who we are and just have a good time and possibly form new crews,” said Watson. King of the Krewe of Anarchy, Lew Attardo, a steam punk themed krewe, went into more detail about the charity aspect of the event. Residents enjoyed food and drinks while each krewe participated in the diaper drive competition to see who could raise the most money. The evening ended with the announcement of the top fund raisers. Krewe de los Muertos came in third, Krewe of Vixens in second and Krewe of Swat in first place.